REDDING, Calif. - For the ninth consecutive year, dozens of Simpson University students will partner with community organizations in the university’s annual Day of Service on Saturday, Sept. 21. 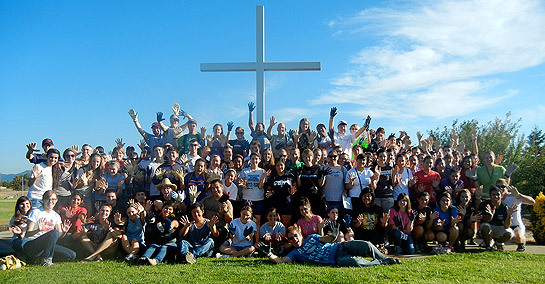 More than 100 students will help with painting, landscaping, graffiti eradication, deep-cleaning, gardening and other tasks at more than 10 locations in Shasta County, including the Martin Luther King Jr. Center, Parsons Junior High School, the Manter House in Anderson, and the Heritage Roasting Co. in Shasta Lake. The Day of Service has become a start-of-the-year tradition at Simpson, where fall classes for traditional undergraduate students begin the day after Labor Day. “This is an opportunity for the Simpson community to serve the community which has housed us for more than two decades,” said campus pastor Travis Osborne. Last year the Day of Service marked the beginning of a new service team initiative (called strike teams) that continued throughout the school year. Almost every weekend, students participated in projects throughout the community, most on short notice. Students logged more than 1,600 person-hours on 30 projects, including cleanup, construction, moving, and maintenance. Those teams have already started serving again this fall. Learn more about the service teams at facebook.com/striketeamsforjesus.